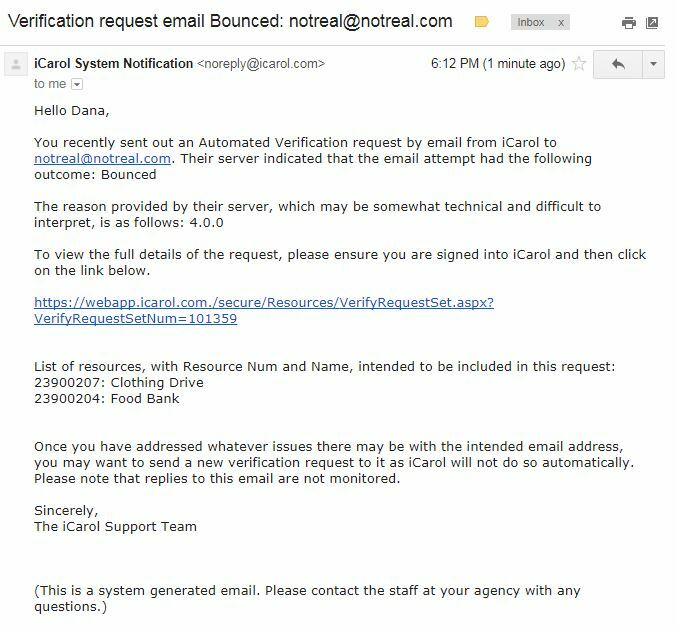 The Automated Verification Request/Response (AVR) feature in iCarol helps you keep resource records reliable and up-to-date, and saves hundreds of hours when compared to sending manual emails, letters, or making phone calls. But, you may find over time the list of Requests sent by you, or your organization, may become long and therefore hard to determine what requests are still open. If you use the AVR feature, it’s also likely your organization has setup a Verification Process, in which you set a certain number of times you’ll reach out to an organization requesting an update be made, and specify the ways in which you’ll reach out to organizations. For example, you may have a Verification Process setup where you send 2 emails to an organization, then if they don’t respond X weeks after the 2nd email is sent, you may try calling the organization twice, and so on and so forth. For this reason, and more, it’s helpful to keep the list of open Requests updated so it can be used as a tool to help keep track of your Verification Process. You can keep this list updated using the buttons at the bottom of each Request to ‘Close’ or ‘Hide’ the request, depending on your desired outcome, in combination with the filters available on this page for which ‘Existing Verification Requests’ you want to include in this list. Updates were recently made to the buttons that control which Requests appear on the list as Open, which ones appear as Closed, and which ones are Hidden. The updates made these buttons more meaningful and user-friendly, making it so each button has a slightly different outcome. 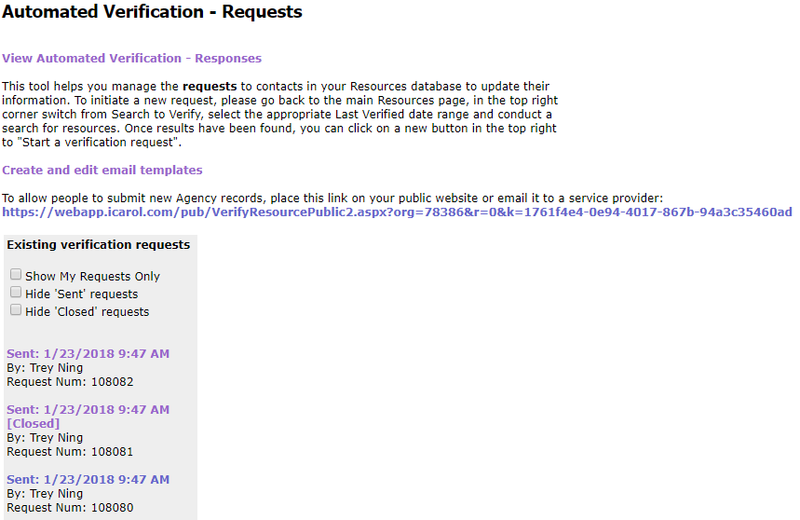 The three buttons available to choose from are ‘Hide this request on the list’, ‘Mark the Request as Closed’, and ‘Mark as Verified and Close’, and each button causes different changes to happen within the resource records included in the Request you’ve selected. After you have your Requests marked as ‘Close’ or ‘Hide’, you can use the filters at the top of the Automated Verification Requests page to show only ‘Sent’ Requests, which are any Requests where you haven’t chosen to ‘Close’ or ‘Hide’, or you can use the filters to show only ‘Closed’ requests. When you choose to use each button is entirely up to you and your organization, and should be based off your internal processes, but the information outlined in this blog provides all the details and information you’ll need to make the best decision for the work you do! For more information about how to use this tool, you can read the help article ‘How to close or hide an Automated Verification Request’. Sean Higgins, Executive Vice President of Cityview, the division of Harris of which iCarol is now a part, will also join us for the Summit and early portion of the conference so he can learn more about the information and referral industry and meet the 2-1-1 and other I&R clients we regularly work with. We’ll start our time in Dallas with our annual User Group Summit, on Sunday, June 3 beginning at 9am. This free, all-day iCarol training is aimed at iCarol users and prospective customers with anywhere from beginner to advanced usage experience with iCarol. The day is a chance for our team to focus in on a few key areas of iCarol capabilities and teaching our users how to leverage their iCarol system for the biggest impact. This year we’ll present two training sessions at the Summit. Our first session of the morning is called Build a Better Picture: Using iCarol Statistics. That session will help attendees identify their reporting needs so they can then build out their contact forms and work flows to support those needs. We’ll take users through an overview of iCarol Statistics with a heavy focus on the analysis tab of reports, discuss Met and Unmet Needs reporting, and talk a bit about how to access data for more advanced reporting needs. Following a brief break, the second session of the morning is titled Do More Together: Are You Ready? and will focus collaboration with partners. There are a multitude of ways you can use iCarol to partner with both fellow iCarol users, and outside organizations that don’t use iCarol. The session will take attendees through the tangible steps to evaluate readiness and then prepare to communicate with potential partners about collaboration. Attendees will leave with an outline and use cases to help them begin to build successful sharing relationships. Attendees will then be released for lunch on their own, and then we’ll reconvene at 1:45pm for a traditional User Group session. All are welcome to the User Group Session, even if they did not register for the sessions held earlier in the day. In the User Group session, we’ll share a summary of the enhancements made to iCarol in the previous year, and speak to the upcoming developments in the works and coming soon. We’ll gain feedback from attendees and use their account of trends, themes, and common requests to help us prioritize upcoming and future developments that will best meet the needs of our customers. If you’re heading to Dallas and will be in town by Sunday morning, it’s not too late to register for the User Group Summit. You can learn more and register here. From there, the AIRS Conference sessions officially begin on Monday morning. Attendees can come visit us at booths 103 and 104 where we’ll have some items to hand out, including a number of data sheet flyers on a variety of topics of interest to conference attendees, including resource data sharing, offering centralized intake, ensuring continuity of care, dispatching mobile crisis services, and information on iCarol data privacy and security. As always we’ll welcome your questions, comments, and conversation on what’s going on at your organization. We always enjoy the opportunity to talk to you about the projects and partnerships you’re engaging in and investigate how we could potentially contribute to that. We’ve long promoted the idea that data sharing can help our clients build coalitions and partnerships, make a greater positive impact in their communities, and create new revenue streams for the organizations. One way we’ve adapted iCarol to make this easier for them is to build support for the Open Referral data standard in iCarol. If you like, before you read about the announcements we’ll go over in this blog, you may wish to get a refresher course on what data standards are, how they make such collaboration possible across different software systems and databases, and why Open Referral in particular has been adopted in iCarol. Today we’re excited to announce two new and exciting iCarol Resource API enhancements, which now extends support for the Open Referral’s HSDS 1.1 schema and a full list of resources. Both of these new enhancements are designed to help you with your sharing collaborations and to access new funding opportunities. iCarol is the first major I&R Software vendor to support emitting resource data that is fully compliant with HSDS 1.1 and the HSDA specification. For over a year iCarol subscribers have had access to downloading resource files from iCarol in the HSDS 1.0 schema, but we are pleased to now announce support for an updated HSDS 1.1 schema in the iCarol Resource API! You can read more about this schema here: Human Services Data Specification (HSDS). This schema creates a common language for software applications to share information across platforms. Our clients in current sharing relationships using our iCarol Resource API have also asked for a way to access a full list of all resources available in their system, or even better, to filter that list by records last updated. We are happy to announce a new Resource API feature allowing a simplified, unpaged list of resources to be returned allowing your data partners to better access and use your resources in external projects. We know that the ability to share data and to collaborate with your partners both within and outside of iCarol is important to you. Sharing resources can also open up new revenue opportunities in your communities. If you would like more information about how iCarol can help you success with your sharing and collaborative projects, contact us — we are here to help! Beginning in 2011, when the United States Senate first recognized Information and Referral Services Day, November 16th was designated to raise public awareness and recognize the critical importance of the I&R field. Every day thousands of people find the help they need quickly, conveniently and free of charge because of Information and Referral (I&R) services. I&R services come in all shapes and sizes, from crisis lines that provide their local community with a core set of human service referrals, to larger scale 2-1-1 centers providing comprehensive Information and Referral services to entire states or provinces covering many different topics and types of services. Information and Referral is the art, science and practice of bringing people and services together and is an integral component of the health and human services sector. People in search of critical services such as shelter, financial assistance, food, jobs, or mental health and substance abuse support often do not know where to begin to get help, or they get overwhelmed trying to find what they need. I&R services recognize that when people in need are more easily connected to the services that will help them, thanks to knowledgeable I&R professionals, it reduces frustration and ensures that people reach the proper services quickly and efficiently. The people who work these lines are consummate professionals who are often times like living, breathing encyclopedias; providing answers to questions ranging from, “Where can I get a free meal for my family” to “There’s a horse running loose in my neighborhood, who do I call?” We at iCarol are really honored to have so many Information and Referral services all across the world use our software to help provide these services to people who reach them via phone, chat, text, or through intake and screening forms or resource searches on their websites. If you’d like to learn more about what iCarol does to support efficient referral management, check out this page of our website that goes over some of those features. You’re also welcome to watch a webinar that focuses solely on our Information and Referral solutions. Happy I & R Day, everyone, and kudos on the awesome work you do connecting people with the services they need, and addressing the social determinants of health in your communities! As we mentioned in our recent blog about the iCarol Ideas Portal, quite a few recent and upcoming enhancements to iCarol are a direct result of contributions and engagement on the portal. That includes these recent enhancements to Automated Verification — the iCarol tool that helps you keep Resource records accurate on a regular basis, and helps maintain AIRS accreditation, with less manual work by your Resource Management staff. Whether you’re sending just a handful or a hundred of requests for verification out to service providers, it’s nice to know what happened to those emails and if they made it successfully to their destination. With this latest enhancement, you now know even more about the outcome of those emails, specifically whether or not they “bounced,” i.e. they encountered a problem along the way and did not make it to their intended destination. This would happen particularly if the email address wasn’t valid, which tells your Resource Managers they may need to contact that organization to verify a valid email to use for future Automated Verification Requests. 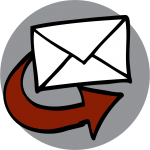 In addition to seeing the bounced status when viewing the original request page, the Resource Specialist who initiated the request will also receive an email notifying them that the request bounced and did not make it to the intended recipient. The additional notification via email will help alert them to the fact that the verifier did not receive their Automated Verification request, which could help them address and resolve the issue more quickly. Sometimes you may want to initiate an Automated Verification Request for a single record in your database. You could certainly do this using the typical method of going to the main Resources search screen, choosing the “Verify” option, and searching for the record you wish to verify. However, often when a single verification is needed it’s because the Resource Manager was actively reviewing the record and notices it needs an update. Or, perhaps another staff member has flagged the Resource and the Resource Manager is investigating. In these and many other cases, it would be very convenient to initiate an Automated Verification Request right then and there, for that single record, without having to go to the main Resource search page. Well, now you can do exactly that! While editing a record, in the section that outlines verification information, a link appears that can initiate the request. When clicked, the link takes the Resource Manager to the page where they configure the request settings. We hope our Automated Verification users enjoy these two enhancements to the feature. We think they’ll help maintain Resource accuracy while saving your Resource Specialists some time in the process. It’s important that your Resource Database information is kept accurate and reliable so that your Call/Chat Specialists are giving out the best information possible. 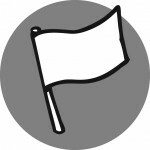 One of the tools that help you accomplish this in iCarol is Resource “flagging” — marking a record in such a way that Resource Specialists or Resource Managers know to give it some attention. Say a client received a referral from your organization last week, but when they call that referral they find the number is out of service, or they reach the organization but are told the program they called about is no longer offered. Oftentimes such clients will call you back to complain or report the difficulty accessing services. In other cases, you may discover the encountered barriers on a follow-up conversation with the client. Another potential scenario — one of the employees of an organization listed in your database may proactively call your service and speak with a Call Specialist to report needed changes to their listing. 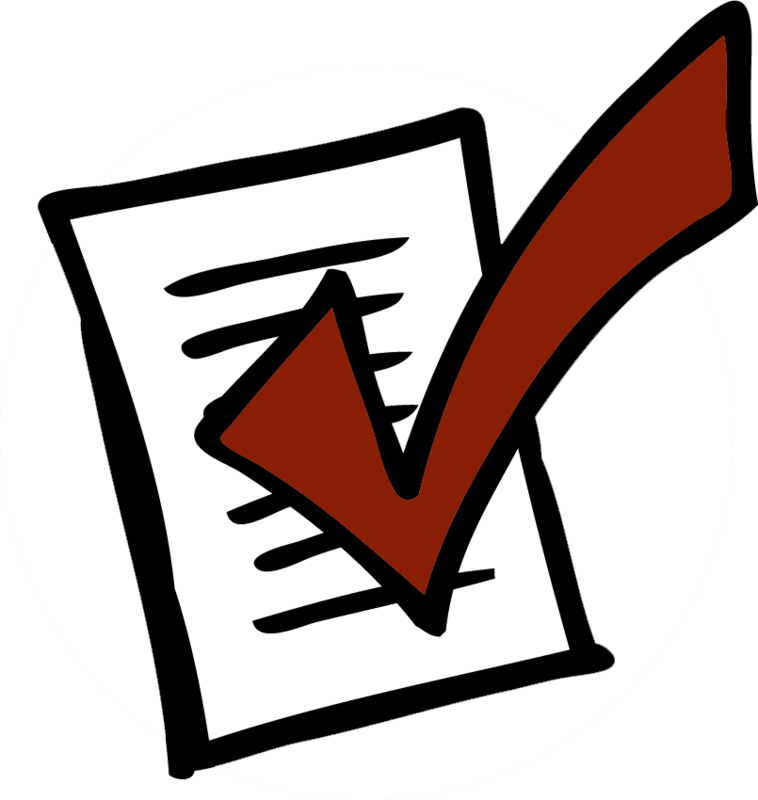 Regardless of how the question is raised to a record’s accuracy, within iCarol your volunteers and staff can go into the Resource record and “flag” that record along with a note describing the necessary changes, or simply note the request that the Resource Manager follow-up with the organization. This process is far better than taking the time to write the Resource Manager an email, or leaving them a note or voicemail. Those steps take time away from your specialists’ responsibility of answering calls or chats and providing other direct services to clients. By simply typing a note in the Resource record within iCarol and hitting the “Submit” button, your specialists won’t have to leave their workstation or stop what they’re doing to pass the information along. This not only saves them time and keeps their focus on serving clients, but also helps safeguard against this important task being forgotten or overlooked. 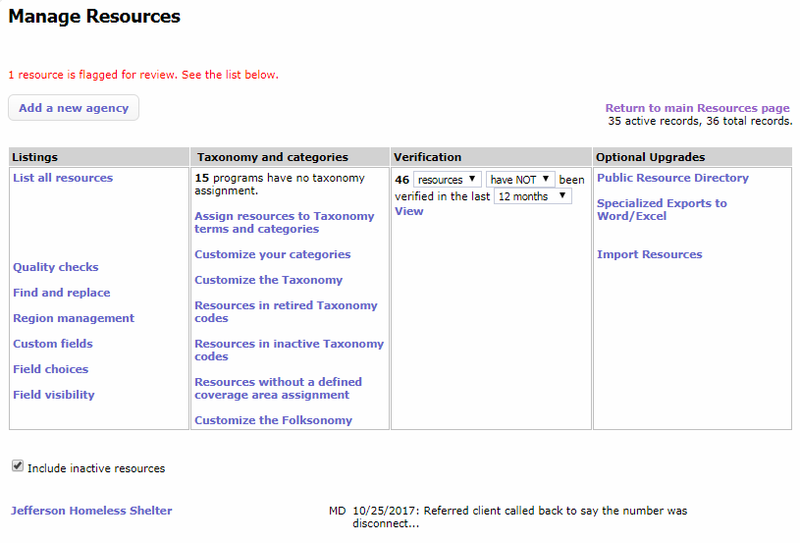 On the receiving end of the flagged Resource is the Resource Specialist or Resource Manager, who will see an alert on the main Manage Resources page noting that a Resource was flagged for review. Simply clicking a link on that page takes the Resource Manager to the full listing where they can review the issue and clear the flag once any investigation and adjustments are complete. Until they do this, others who view the record as a potential referral for a client will see that is has been flagged, so they know to be aware and proceed with caution before providing it as a referral. With this latest enhancement, in addition to the in-system alert seen at the top of the Manage Resources page, certain staff can also receive a system generated, automated email alerting them that a Resource has been flagged. This additional alert helps Resource Managers respond more quickly when a Resource record’s accuracy requires review. If you wish to disable this setting for all users of your iCarol system, but the size of your staff makes this an onerous task to complete manually, please open a case with our Support Team and they can assist you. Your case should contain the subject line: “Disable the ‘Resources flagged for review’ setting for all our users.” For a limited time our Technical Team can run a script to turn off this notification en masse for all users in your system. We’ll honor requests for this action through December 31, 2017. For example, many people choose to have fields like Address and Phone number shown only for the Program, Site, or ProgramAtSite resource records, and not the Agency record level. There are probably several fields that you don’t wish to appear on the Public Resource Directory listing for the public, but you would like to have them appear in your internal iCarol system for your I&R and Resource Specialists. Customizing the fields being shown and editable at each level of the resource hierarchy is controlled using iCarol’s Resource Field Visibility tool, which recently underwent some very helpful enhancements. These enhancements are a direct result of the feedback we’ve received from clients about this tool. Among this feedback was that the tool took too many clicks to operate, not all fields were available, some fields that were available shouldn’t be, and more. In addition to this feedback about what wasn’t working, clients offered some great suggestions on what could be added, such as ways to control the visibility of fields appearing on resource PDFs, and ways to enhance resource quality by requiring some fields to be required and always have values or text entered when editing. Important note, we’re making the new Field Visibility tool available users now as a BETA feature. We welcome you to use it and test it out, and report any problems to the Support Team. Right now the new tool is available for configuration by Admins and those with Resource Manager security settings, but please note that the new Field Visibility settings and new version of the tool will not be applied to your system until you switch over to use the new tool (instructions below). Right now, these settings can only be used to control Resource Viewer, Resource Editing, Resource Auto-Verification, and Resource PDFs. Support for either version of the Public Resource Directory and Resource API are coming very soon. You will arrive at this page. When you navigate to this Field Visibility Settings page, you’ll note that to the right is a setting which shows which version of the Field Visibility tool you are currently using. Until you switch to ‘BETA: New field visibility settings,’ your settings as they are on the old tool remain in place. 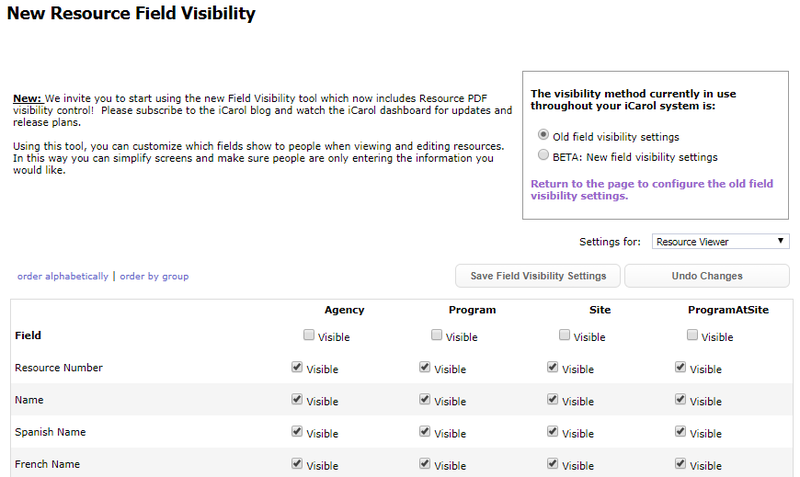 Warning: If you click on ‘BETA: New field visibility settings,’ you will be switched over to the new tool. We advise that you first configure your new settings before making the switch. Like the old tool, the field names appear down the left, and there are four columns to represent each level of the resource structure hierarchy: Agency, Program, Site, and ProgramAtSite. The new tool can currently be used to change the following areas: Resource Viewer, Resource Editing, Resource Auto-Verification, and Resource PDFs. To decide which of these you want to change the visibility settings for, select the appropriate one from the dropdown list. Where appropriate, for instance the settings used for Resource Editing, you can note that a field should not only be visible, but should also be required to have a value or text entered. Some fields, like ‘Name,’ are already set to be required and this is not editable, as having a Resource name is necessary in every record. These requirement settings will help you ensure important and necessary fields are not left blank, and results in cleaner and more accurate resource data management. There is a “Select all” or “Apply to all” setting at the top of each hierarchy column, allowing you to either turn visibility on or turn it off for every field* in the list with a single click. *does not apply to the ‘Name’ field as this must always be visible. If you use Custom Fields, they appear at the bottom of the fields list. This allows you to control Custom Field Visibility in the same place as all other Field Visibility, rather than needing to navigate to the Custom Fields settings area of iCarol’s resource management tools. While changing your settings, it may help to have the field names appear alphabetically rather than having to sort through their typical groupings. Here you can change the field order from grouping to alphabetical and back again. If you haven’t yet Saved your changes and would like to undo the settings changes you made, simply click the ‘Undo Changes’ button. After clicking this button and clicking through a warning message, all settings will revert to what they were at your last save point. When you are ready to save the Field Visibility settings, click the ‘Save Field Visibility Settings’ button. When you’re satisfied with the settings under the New Field Visibility Tool, and have saved your settings, you can then switch over to putting the new tool into use whenever you like. To do that, simply click the ‘BETA: New field visibility settings’ button. We hope you enjoy the New Field Visibility tool and that you find it useful. Our goal was to apply all the helpful feedback we’ve received over time and make the process more streamlined and efficient, while offering even more options, control, and helping with clean data management. If you have questions or need to report any issue with the BETA of this tool, please contact the iCarol Support Team. From October 1-3, our Director of Business Development, Polly McDaniel, will head to the Texas AIRS (TAIRS) Professional Development and Education Training Conference in San Antonio, Texas. 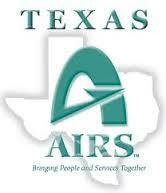 This year’s gathering is extra special as TAIRS celebrates 40 years of supporting Texas I&R agencies. In addition to the learning opportunities offered at the TAIRS Conference, this is a great time for us to recognize in person the amazing work the Texas Information and Referral Network accomplished during and following the devastation and flooding in southeast Texas, caused by historic Hurricane Harvey. We are honored to be the software supporting the TIRN network as they assist their neighbors in need. At the TAIRS conference we’ll be on hand to answer questions, meet and greet members of the Texas Area Information Centers, meet additional information and referral providers from across the state and take part in sessions and conversations that will help us better understand the needs of those providing I&R across Texas so we can continue to provide the best service possible. You can find out more about the conference here and on their event page. Be sure to follow us on Twitter to follow along with our activities at the conference! Congratulations to our friends at Ontario 211 (ON211) — recent winners of the 2017 Citizen and Community Global Impact Award for their website, along with partners BDO IT Solutions. This award is granted to an organization that exhibits excellence in creating solutions that improve communities. This award is a result of a partnership between ON211 and BDO IT Solutions to create a cost-effective, web-enabled solution aimed at transforming ON211’s online presence and among other goals, making their website easier for community members to navigate and find needed resources. BDO worked closely with Ontario 211 Services to develop the service on Microsoft’s technologies and implement in the Microsoft cloud, Azure. ON211 Resource records are curated in the iCarol database and that data is made accessible to the website via the iCarol Resource API. Read ON211’s full press release about the project and award here. Find out more about iCarol’s Resource API here and here, and please contact us if you’d like to learn even more about using the Resource API at your organization. The new Public Resource Directory is here! One of the greatest challenges for non-profit services is adapting to the new and varied ways in which the people in your community want and need to access your services. We’re dedicated to helping our clients face those challenges head-on with innovative solutions that help you help your community through the methods that work for them. One of those solutions is iCarol’s Public Resource Directory (PRD): A feature that takes your iCarol Resource Database and turns it into a public-facing, searchable directory of community services. By taking your internally curated database and placing it online for public access, you’re expanding your reach, helping more people, and accommodating the growing number of individuals who prefer self-service over engaging directly with your specialists. A built-in Guided Search builder that allows your Resource Specialists to bypass web developers and instead build a guided, graphical search right within the PRD. 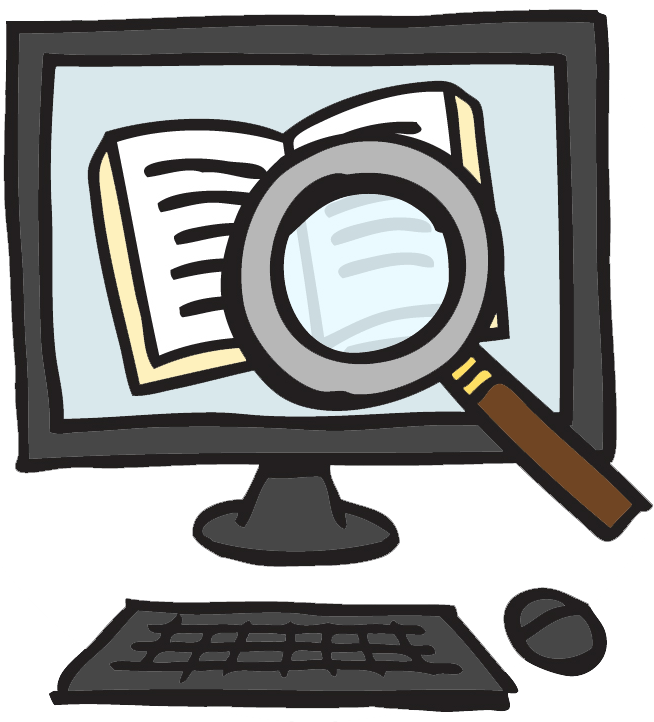 For more on guided searching, stay tuned to our blog for details on an upcoming webinar on that topic. Intuitive geographic searching that is easy for your visitors to use. They can simply begin typing in their known geographic location, be it zip/postal code, city, county, or state/province, to produce results that are relevant to their location. Expanded customization around the look and feel of the PRD using Cascading Style Sheets that allow you to blend the search seamlessly into your website with highly granular control over things like font sizes types and colors, background color, logo integration, and more. Mobile responsive functionality, delivering a mobile-friendly experience that rivals that of more costly mobile apps and accommodating the many individuals using their mobile phones or other handheld devices as their primary means of accesing the internet. Relevant search results that improve your clients’ outcomes over what they’d likely experience if they tried to search for helpful resources on their own via a regular internet search engine. When your web visitors search or browse your PRD, they’re benefitting from your expert curation of the resources, reducing their frustration and confusion as they try to address their challenges. To see some of these benefits in action, check out our video about the Public Resource Directory. The PRD is available now and we encourage you to contact our Support Team to learn more about the upgrade process. Also stay tuned to our blog for announcements on upcoming webinars that provide further insight on using the PRD.